The Casale Vacanze is situated at Siculiana in Via Concezione Nr. 22. Siculiana lays on the SS. 115 (E 931) at the kilometre 169,700. Rich of unforeseeable views and surprising landscapes, natural beauty and a deserving architecture lays Siculiana, a little city full of history in a strategic point between the striking Valley of the Temples of Agrigento and the prestigious Thermal Baths of Sciacca. Only a few kilometres away you can find the city Porto Empedocle, where the ferries start to Lampedusa, to the snow white and enchanting Turkish stairway (Scala dei Turchi), and to the Greek theatre of Heraclea Minoa. But Siculiana offers the careful and curious visitors also a beautiful historical centre, characterized by old noble mansions, the Castle Chiaramontano and numerous holy buildings, among which the Mother Church, where the devout celebrate every 3rd of May the simulacrum of the black Christ. The holiday home “Casale Vacanze” is situated in the characteristic and historical centre of Siculiana. The windows do overlook the roofs of the old part of the city, so to admire the near Mother Church, or better the Sanctuary of the most holy crucifix. Domicile of the Casale Vacanze is an old residence which has been carefully and meticulous restored. 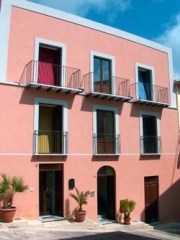 Casale Vacanze is made of four apartments and five rooms able to welcome you during your vacation in Sicily. Every little accommodation is different to the other, because of different colours. We used rose, sky blue, basil green and lemon yellow, that is colours of the Mediterranean nature, and we are sure that you will be involved by its colours and smells. Every “home” has got a large living-room, is provided by a well- finished bathroom and a functional kitchen with every utensil and domestic appliances (refrigerator, dishwasher, cooking place) necessary to guarantee your independence. There are two stairways at disposal for the four apartments on two levels (two on every floor), and the five rooms are arranged on three floors. They are furnished by a young stile with love to the details. The wooden ceiling, based on the thick, old walls, creates a warm and pleasant atmosphere. With an incomparable hospitality you will have the sensation to be at home, but when you go out on the balcony and you do overlook the place, you do immediately remember to be on holiday. From up here you have a view over a part of the historic centre of Siculiana, while the natural light is coming inside to be reflected on the bright and coloured walls. Taking care of the environment we use solar power systems to warm the water and solar panels to produce electricity. The thermal comfort is ensured by air conditioners. You don’t miss TV, phone, fridge-bar in the rooms, wireless network and an adequate cleaning service. The breakfast will be served at the ground floor, where you find the reception, a drawing room and the “caffetteria” where to taste typical dishes and local foodstuffs. To come to us from Palermo by car it’s possible to go on the Fondovalle Palermo-Sciacca until the SS. 115, direction Agrigento, or you can choose the SS. 189 to Agrigento and from there on the SS. 115 in direction Sciacca. From Trapani you simply have to reach Sciacca and to continue like above. From Catania you take the motorway Palermo-Catania until Caltanissetta and than you continue on the SS. 640 to Agrigento. Than go ahead on the SS. 115 in direction Sciacca. The Bus Service connections to Palermo, Agrigento (and Province), and Trapani (and Province) is ensured by the firm Salvatore Lumia s.r.l..
“From and to” the airport Falcone-Borsellino at Palermo the Bus Service is ensured by the company Sal s.r.l. with departure and arrival at Porto Empedocle, while “from and to” the airport Fontanarossa at Catania the Bus Service is made sure by the joint-stock company Sais Trasporti S.p.A. with departure and arrival at the Piazzale Rosselli at Agrigento. You can find timetables and details about the services of the mentioned companies in their internet sites, or you can ask information using the underneath mentioned phone numbers.